Japanese Jujitsu is the fighting art of the Samurai. 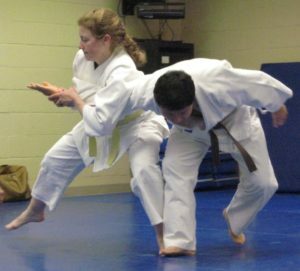 It is a comprehensive martial art that includes virtually every type of fighting technique. Best known for its throws, jujitsu also includes karate-type striking and kicking; leg trips and sweeps; arm and hand techniques; ground wrestling; and submissions such as chokes and armbars. Men & Women, Girls & Boys, Ages 12 and above are welcome. Lessons are just $50 month-to-month. No contract is required. $100 flat rate for families. $10 drop-in fee. Men and Women Ages 16 and above. Two free introductory classes. $50 month-to-month.